God gave me a little gift in the form of an answered prayer on the eve of the feast of Christ the King. I had been asking for direct instruction. How do I pray? He gave me a simple scenario that I can apply to my prayer life. God has always had a way of teaching me through my own personal parables per se. I think He does this for all of us, if we take time to pay attention. Upon tiptoeing into my bedroom to check on my napping baby, I looked up above the co-sleeper and saw a spider dangling from the ceiling. Gasp. I hate spiders. All insects really. I had to decided what was the best course of action, and if it demanded me waking “fussy diapers” who was finally in a peaceful slumber. I was alert. I was focused. I was not going to waste anytime. My baby was about to have this spider drop on him. Within a few seconds of this prayer I moved the co-sleeper slightly over, and a few seconds more the spider gently plopped on its own onto to a place where I could pick it up and shoo it outside. Away from the baby. Everyone was safe. 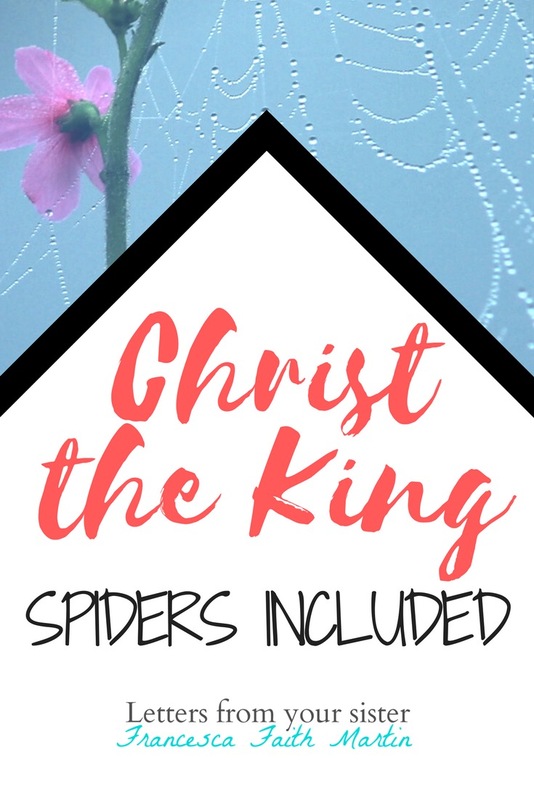 I have been praying for God to show me how to pray, and here – the epic saga of me and this spider- God gave me the grace to experience the pattern of prayer I should follow. From my personal parable I learned to stop, call upon him immediately, and wait. And while waiting, continue to pray unceasingly. Do this without anxiety or fear so that your senses are alert and you can listen to his promptings. Most importantly, He has it. He hears what you want. Let Him take care of your needs. Pray and do not have any anxiety at all for Christ is King. What an inspiring story! Thank you for sharing.